eToro is a leading, professional brokerage company for anyone who wants to invest online. They cover stocks, currencies, commodities, indices and ETF, providing a user-friendly experience so that anyone can take advantage of their investment opportunities. You can invest in global markets and industries, seeking out your favorite companies or commodities and checking their sales values over time. Investment is quick and easy, designed for first-time investors and seasoned professionals alike. Started in 2006, eToro now has more than 4.5 million investors using its tools, with investment opportunities in over 170 countries. From the moment we logged on to eToro we found it exceptionally user friendly; a pleasure to navigate. Signing up is easy, as is activating your account and the customer support is excellent. Whilst some other products in this category leave you to figure out online trading for yourself, eToro leads you step by step through all you need to know to begin trading successfully online. Basically, users make deposits with eToro which get converted directly into an online balance. With this online balance, users can set up trades on currency pairs, commodities or international stock markets. Upon each trade you have the option to set the risk level and set values at which losses or profits are stopped or taken. The risk level, or leverage, can be set at a maximum of 1:30. This tool acts like a multiplier with which you are effectively borrowing money in order to increase your potential profits (or losses). For example, if you buy $50 dollars worth of Euros and the Euro increases in value by 10% your investment will have increased in value by $5. However, with a leverage of 1:30 you will enjoy benefits to a value of $150. Investments of small amounts with a high leverage will fluctuate rapidly while larger amounts with a low leverage will be more steady. Profits and losses can also be managed by adjusting the levels at which your trades are sold automatically. We’ll get into the specifics of each trading area shortly, but it’s worth acknowledging a few of the site’s more general attributes first. Once you have invested, there are various tools such as price charts and economic calendars with which you can track the progress of your investments; with this information in mind it is simple and easy to make trades. eToro is available in two modes; visual and expert. Visual mode makes online trading much easier to understand, as you are able to see exactly what you are effectively buying while expert mode makes it easier to simultaneously track all your investments as well as make faster transactions. As a massive stockbroker, eToro enjoy a high level of liquidity, allowing users to make instant orders at the exact price they see. In fact, you can set up a 'one-click buy' mode which enables you to make a trade by simply clicking on the relevant currency, stock or commodity. These features are vital in a market that is changing rapidly and (seriously) a matter of seconds could mean you miss out on a great rate and high profits. This becomes especially relevant when we take into account the leverage that eToro offer, which is one of highest on the market and means that tiny fluctuations can lead to big profits (or losses). Furthermore, eToro also offer some of the lowest spreads (trading costs) on the market, as low as 2 pips (points) on the major currency pairs. This makes eToro especially conducive to trading that involves many transactions. However, as with all trading platforms, you must be careful not to make too many transactions or else you will see your profits eaten away by the associated trading costs. 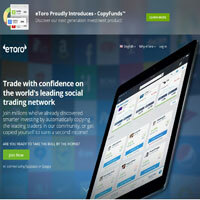 A major selling point of eToro is its social trading element. As you browse the site, you’ll see that you can interact with other traders, sharing information, graphs, personal opinions and more. It’s a bit like a traders’ version of Facebook or Twitter, where you can leave messages for others to comment on. There are also opinion polls and more. This can really help with your investments, as it allows you to read their profiles, see how they invest when the stakes are high or low and even copy the actions of others through the CopyTrader feature. Copy Trader is a really clever idea. Essentially it allows you to copy the investments of other users. You can quickly search for the most successful traders on the site, read about their investments and strategies, and then assign some of your credit to instantly copy their buying and selling techniques. This can be done manually or automatically, with the system reinvesting your money to mimic your favorite traders' behaviour. If you're not too sure what to invest in, when to sell and how to manage your accounts, this is a really useful system for trying to easily make a profit through adopting other members' understanding of the markets. eToro offers the chance to become a Popular Investor. Through this upgrade, you can earn up to 2% AUM (the total market value of financial assets under the control of eToro), which can earn you monthly income on top of your normal profits. There are four different options to choose from here: Cadet, Rising Star, Champion or Elite. If you’re thinking about some serious trading, becoming a popular investor may be worth considering. EToro offer a simple to use system for all levels of trading. eToro offer a simple to use system for all levels of trading, allowing you to create a watch list, monitor stats, read a news feed, view charts and more. There are also webinars and other online services (such as a blog and news updates) to help you learn about how to maximize your trading potential. You can quickly and simply trade with just a couple of clicks, and the site keeps up to date with recent technological developments which make the whole process smooth. As you can see in the images we've included in our review, viewing market trends over time, current prices and trading options is quick and simple. eToro.com allows you to trade in several key areas, so let’s examine some of those now. Currency is the biggest trading market in the world. You can locate specific currencies or particular two-currency trades, examine their history and then invest in those you think will make a profit over night. We were particularly impressed by the level of detail in the online graphs, wherein you can zoom in or out to view trends over very long periods of time, or on a much shorter scale. You can also use the site’s social networking services to discuss potential future trends with other investors, allowing you to improve your odds of profit. Be warned, however, that eToro takes its cut from profits at 17:00 New York time, so you should take this into account when considering an investment into currency. Invest in a wide range of stocks from globally renowned, top level companies. You can find your favorites based on the industry or exchange they’re located within. These include NYSE, technology, consumer goods, services, financial, healthcare and more. You can also perform an advanced search to locate potential winners, whilst viewing the sell and buy prices, or profit and loss over time, with one-click trading. This is all available on your mobile device too, and the whole service includes competitive spreads and well-considered terms to help you avoid large losses. Trading in premium commodities such as gold, silver, oil and gas is, yet again, very simple here. There are no big surprises regarding which commodities are available, but the main attractions are all on show. As with other investments, you can easily view the buy-sell histories of each commodity and talk with other users about potential changes. More variety here might be welcome, but if you’re only interested in the main 7 commodities on the market, you’ll find them here. 13 global markets are covered in this section, with DJ30, AUS200, EUSTX50, JPN225 and NSDQ100, amongst others. Here, the instant update (color coded to show you when things are moving in the right direction) really helps to identify potential shifts, as well as providing an overall stats for each market telling you whether it has risen or fallen since the last trade day. A wide variety of ETF’s are available for the right investors. Feeds and charts are specific to each potential investment, allowing plenty of information to flow and, therefore, helping you to decide which investments to follow. You can also filter the results or view them in a comparisons chart to find out which markets are up or down, and the overall sentiments of investors. These can then be reordered to suit your particular interests (such as buying and selling rate, or to switch between 1 Month, 1 Day or 1 Week. eToro.com provides a supportive online space where you can ask other traders for help by posting on live feeds as you browse markets. This is really helpful if you want very particular information on how a market price might alter, or if you're interested in events or trades which might impact on your investments. There's a great sense of camaraderie here because nobody wants to lose money, so sharing insights and news is vital to making wise investments. In addition, the site is designed to make deposits and withdrawals very simple and quick, with a variety of payment methods to suit your wallet. For more technical support, or for questions relating to how the site or systems function, we recommend checking the FAQ or asking the site's support team (24 hour, professional, multilingual staff) for assistance. eToro is a regulated brand, meaning that you can rest assured of its legitimacy and that it should function within the law. This means that trades should be fair and that it includes segregated accounts, so you shouldn't ever be liable for someone else's mistakes. Regulation also requires that the site takes extreme care over its privacy and security protocol, so your information should never be released without your permission. To find out more, please visit the website, where details of the eToro regulations can be found. These include office addresses, terms and conditions, and the requirements for qualifying as a Premium Client. With a wide variety of investments available, 1-click trading, copy trade options and a strong social networking element, eToro is suitable for newcomers and professionals alike. Whilst some more sophisticated traders might find it overly simple or perhaps limited at times for certain markets, there’s no doubting that it is a premium website for online trading. *Disclaimer: CFDs are complex instruments and come with a high risk of losing money rapidly due to leverage. 65% of retail investor accounts lose money when trading CFDs with this provider. You should consider whether you understand how CFDs work and whether you can afford to take the high risk of losing your money.